Ballymena United boss David Jeffrey has called on his players to deal with the frustration of their defeat by Linfield ahead of the visit of Cliftonville. 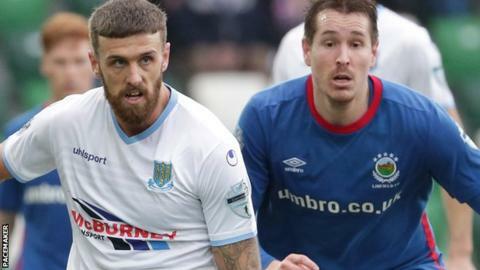 The second-placed Sky Blues fell nine points behind the league leaders with their second successive 1-0 loss to them at Windsor Park on Saturday. Jeffrey felt his side were denied a clear penalty, but stressed they must put that behind them when the Reds come to the Showgrounds on Tuesday. "We must dust ourselves down," he said. "When teams have accrued the number of points that Linfield have and opened up a nine-point gap, then they deserve to be congratulated. "But nothing will change. It is still one game at a time for us and that game is now against Cliftonville, so we must give of our best on Tuesday. "We have to get over the disappointment and frustration of the match against Linfield, particularly with how things that were out of our control went against us." The Reds will travel to the Showgrounds having won both of new manager Paddy McLaughlin's first two games since he took over at Solitude from Barry Gray. And, while Ballymena have a game in hand on Linfield, Jeffrey is well aware how important Tuesday night's match is if United are to catch his former club. "Paddy has come in and has got Cliftonville up and running," Jeffrey observed. "They will very much want to kick on now as the bounce which teams usually get when a new manager comes in has been very evident. "They are a very good side, packed full of quality players and we know how tough the match will be." Linfield are also in action on Tuesday night as they travel to take on basement side Newry City. Darren Mullen will be looking for a response from his side after they dropped to the foot of the table with a 3-1 defeat in their relegation battle away to Ards on Saturday. At the Oval on Tuesday, 10th-placed Warrenpoint Town have an opportunity to go level with Glentoran in ninth as they take on Gary Smyth's men. Both sides suffered defeat at the weekend, with the Glens losing away to Coleraine and Point being beaten at home by Cliftonville. There will be coverage of Tuesday's three Irish Premiership fixtures on the BBC Sport website and Radio Ulster MW, from 19:30 GMT.